Chris Gayle today smashed the most breathtaking knock in the history of Twenty20 cricket, blasting an incredible 175 off a mere 66 balls, as Royal Challengers Bangalore crushed a hapless Pune Warriors by a record 130 runs in the domestic T20 league match here. Gayle hit the fastest century, off just 30 balls, and the highest-ever individual score in a T20 game, surpassing Kolkata Knight Riders' Brendon McCullum, who hit 158 off 73 balls against RCB at this very Chinnaswamy Stadium. Kings XI Punjab made light of the early exit of captain Adam Gilchrist, and the fall of Luke Pomersbach and Mandeep Singh off successive balls, to cruise past Delhi Daredevils by five wickets to record their fourth win in seven matches in the domestic T20 championship at the Ferozeshah Kotla ground. The qualifying contests in the Yonex Sunrise India Open Badminton Series at the Siri Fort Stadium here today was mostly among Indian players though a few foreign players who featured in the day’s action had a tough time crossing the initial hurdle. The Wrestling Federation of India (WFI) today expelled Kartar Singh, its former Secretary General and former President of Punjab Wrestling Association, from the WFI as well as all its affiliated units for six years. He has been charged with grave misconduct and indiscipline. Manchester United produced a performance of style and swagger to extend its record haul of English league titles to 20, overwhelming Aston Villa 3-0 to wrap up the championship with four matches to spare and reclaim the trophy from local rival Manchester City. When ace shuttle player Jwala Gutta went to address a badminton clinic, “Kid Konnection”, at a private school after watching the qualifying matches of the Yonex Sunrise Indian Open Super Series , she was surprised to see 500 aspiring players eagerly waiting to hear her out. Chris Gayle today smashed the most breathtaking knock in the history of Twenty20 cricket, blasting an incredible 175 off a mere 66 balls, as Royal Challengers Bangalore crushed a hapless Pune Warriors by a record 130 runs in the domestic T20 league match here. Gayle hit the fastest century, off just 30 balls, and the highest-ever individual score in a T20 game, surpassing Kolkata Knight Riders' Brendon McCullum, who hit 158 off 73 balls against RCB at this very Chinnaswamy Stadium. 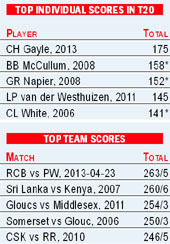 Incidentally, RCB's total of 263 for five was also the highest-ever total in any T20 game. Chasing a T20 world record target of 264, Pune could not manage more than 133 for nine in the alloted 20 overs, paving the way for Bangalore to post the biggest IPL victory in terms of runs. Put into bat, it was the 'Gayle Force' that blew away the Pune Warriors as the big-bodied Jamaican once again showed his power-hitting ability, striking a staggering 13 fours and 17 sixes en-route to the fastest and highest-ever T20 score. 154 out of his total runs came in boundaries and off only 30 scoring strokes. Typically, he brought up his century with a six off Ashoke Dinda, which sailed over the stadium and in the process also damaged the roof.The carnage started from the second over, bowled by rookie paceman Ishwar Pandey. Playing his first IPL match, Pandey found out what top-level cricket was all about as Gayle hit him for five boundaries taking 21 runs of that over. Mitchell Marsh and Aaron Finch got even worse treatments as they went for 28 and 29 runs in their respective overs as both were clobbered for four sixes each. 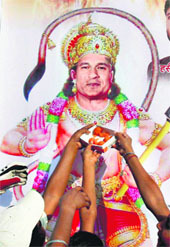 There was minimum fuss as usual in Gayle's batting as he barely had any footwork. It was just stand and deliver as the ball kept on sailing into the stands and there was little that skipper Finch could have done. Intimidated by this mayhem, the Pune bowlers could only go through the motion. All the three changes made by PUne backfired as Pandey gave away 33 in two overs while left-arm spinner Ali Mutaza conceded 45 from his two overs. It was Bhuvneshwar Kumar, who returned unscathed with figures of none for 23 from four overs. Marsh, who came back in place Ajantha Mendis was hammered for 56 in three overs, while the profligate Dinda went for 48 off four overs. Gayle and Dilshan added 167 runs for the opening stand with Tillekaratne Dilshan (33). Kings posted 121/5 with 18 balls to spare to inflict Daredevils their seventh defeat in eight matches, to severely dent their chances of a recovery. The visitors seemed to be in trouble when Gilchrist was caught by Johan Botha off Irfan Pathan for 6 in the third ball of the first over. But Ashish Nehra was whacked for three consecutive fours in the second over by Mandeep Singh as the left-arm pacer gave away 14 runs in all. When Pathan was taken to the cleaners in the third over for 19 runs, with four boundaries, the match looked to be firmly in the grip of Kings XI as they raced to 40 for 1. Though the fall of Pomersbach and Mandeep Singh in Van der Merwe’s over reduced Kings to 3 for 51 in 4.5 overs, they weathered the storm deftly to craft a comfortable win as Daredevils’ total was too meager a target to bother Kings much. Kings XI had taken a tight hold on Daredevils when they restricted the hosts to 120 for 7. After their handsome win against Mumbai Indians two days ago, Daredevils once again got into a self-destructive mode to push themselves into a corner. Kings’ skipper Adam Gilchrist won the toss and opted to bowl. And Praveen Kumar drew first blood off his fourth ball when he induced Jayawardene (4) to offer a catch. KXIP are now placed fifth in the points table with eight points, while DD are lying at the bottom (2 pts). RCB (12 pts) are on the top. Pune are at the eighth place. The notice said Modi was using the aircraft for personal reasons but set up dummy companies to import it by falsely availing Customs duty exemption. The DRI has relied on the various e-mails between Modi, his former employee and confidante Deepa Palekar and other facilitators to substantiate its claims. The Rs 100 crore Bombardier Challenger 300 aircraft was imported by Vile Parle-based Golden Wings Pvt Ltd (GWPL) from Peel Aviation, Ireland, for a lease amount of Rs 10.85 crore for a period of 7 years beginning May 2008, according to reports. Former national champion and international Chetan Anand had a comfortable outing in the men’s singles first round qualifying match when he rushed past compatriot Abhimanyu Singh 21-17, 21-12 while another Indian favourite, Arvind Bhat, disposed off Poodchalat Pisit of Thailand 22-20, 21-19. Seasoned Anup Sridhar too coasted home in straight sets with a 21-11,21-12 win over Mohit Kamat as most of the fancied Indian players overcame the qualification process without much ado. In the girls singles, Dhanya Nair gave a tough run to Russia’s Anastasia Chervaykova before bowing out at 21-10, 20-22, 21-14. In the doubles, the US-India pair of Raunaq Muradia and Kamaldeep Singh survived a mid-match scare before prevailing over KK Manjush Mohan and Venkatesh Prasad 17-21, 24-22, 21-16. The action will pick up only when the stars like Saina Nehwal, Sindhu and others display their prowess though the Siri Fort stadium was a beehive of activity, with the qualifying matches going their paces in a methodical manner. Following are the other qualifying match results: Men: Oscar Bansal got walk over from Joachim Persson of Denmark, Sameer Verma b Mayank Behal 15-21, 21-8, 21-14; Subhankar Dey b Rohit Yadav 19-21, 21-18, 21-13, Aditya Prakash b Prakash Jolly 21-11 (retired); H.S.Prannoy b Vikas Harsha 21-19, 1-0 (retd); Women: Mohita Sahdev b Yamini Sharma 21-12, 21-15; Rituparna Das b G.M.Nischitha 21-10, 18-21, 21-11, Ruthvika Shivani b Mudra Dhainje 17-21, 21-10, 21-13; Trupti Murgunde b Riya Pillai 21-14, 8-21, 21-18; Varsha Belawadi b Asmaa Badie Twafeek (Egypt) 21-19, 21-14; Jacqueline Rose Kunanth b Juhi Dewangan 21-10, 21-16, Saili Rane b Nisha Karamchand 19-21, 21-12, 21-10. Kartar is a two-time Asian gold medallist, and has won numerous other international medals. He was given the Arjuna Award in 1982 and was bestowed with Padam Shri in 1987. In a special Meeting of General Council held at New Delhi today, WFI accepted the recommendation of the Disciplinary Committee headed by Senior Vice President ID Nanavati and expelled Kartar. The WFI blames him with disobeying the orders of WFI and International Federation (FILA) regarding the postponement of the Shaheed Bhagat Singh International Wrestling Tournament 2012, and bypassing WFI to correspond directly with FILA and Government of India. WFI claims that Kartar organized a sham tournament in which no top-five Indian wrestler participated, nor did any wrestler nominated by any country's national wrestling federation. WFI claims that Kartar obtained a huge sponsorship amount of over Rs 1 crore by misrepresenting facts and refused to submit the audited accounts to WFI. However, refuting all allegations Kartar said he was being victimised on the behest of GS Mander, who was an advisor of WFI. “They are talking about financial irregularities whereas they had not even spent a single penny for this tournament,” Kartar said. "We organised four tournaments under Shaheed Bhagat Singh Sports Cultural Club with the help of donations. They really cannot question how we collected the money and spent it, but I still gave them details of the expenditure. The only reply I have been getting from all senior functionaries is that Mander was adamant on expelling me and they were helpless despite knowing that I was right." He said that the Shaheed Bhagat Singh tournament 2012 was approved by WFI's then secretary Raj Singh as there was no president at that time and he had the proper paid fees for the tournament, but other federation members manipulated FILA to get the tournament cancelled. "By that time, we had sold all tickets and invited players and therefore we decided to hold the tournament under our club, which means that not even a single rupee was spent by the WFI. A lot of money had already been spent and we could not have backed off," he added. "It doesn't really matter whether I am in WFI or not. I will continue to promote wrestling," he said. Van Persie, United's driving force all season, scored all three goals in a clinical first-half display. Dressed for the occasion — he was wearing the No. 20 shirt. "It's a great feeling," said the Netherlands striker, the top scorer in the league with 24 goals in his first season with United. "It is a fantastic team and fantastic players. It is a championship for every single one of them." Alex Ferguson's decision to sign Van Persie in the last offseason for 24 million pounds ($36 million) — a hefty price for a previously injury-prone player with just a year left on his Arsenal contract — has turned into a masterstroke. As Ferguson ambled into the center circle moments after the final whistle to soak up the party atmosphere, he was soon embraced by Van Persie, who left Ferdinand and the rest of his teammates celebrating in front of fans and made a beeline for the Scot. "I remember (Arsenal manager) Arsene Wenger saying he's a better player than you think — I think he could be right," said Ferguson, who secured the 49th trophy of his managerial career. "In terms of impact, I think it's as big as anyone I can remember." With United needing a victory to dethrone City, Van Persie led the charge by scoring the opener after only 83 seconds and then steering in a sublime volley in the 12th. The party had started in earnest by the time he wrapped up his hat trick in the 33rd, giving United an unassailable 16-point lead over City. United clinched a 13th title in 21 seasons of the Premier League with nearly a month remaining in the season — all under Ferguson and the earliest a club has clinched the Premier League title since United in 2001. "It is sweet, it doesn't matter when you win it," Ferguson said. "The consistency has been phenomenal. We have lived up to the expectation." New Delhi: There is some uncertainty over Chennai as the venue for the eagerly-awaited World Chess Championship match between Viswanathan Anand and Magnus Carlsen after the World No 1 player from Norway expressed unhappiness with the FIDE's choice of venue.